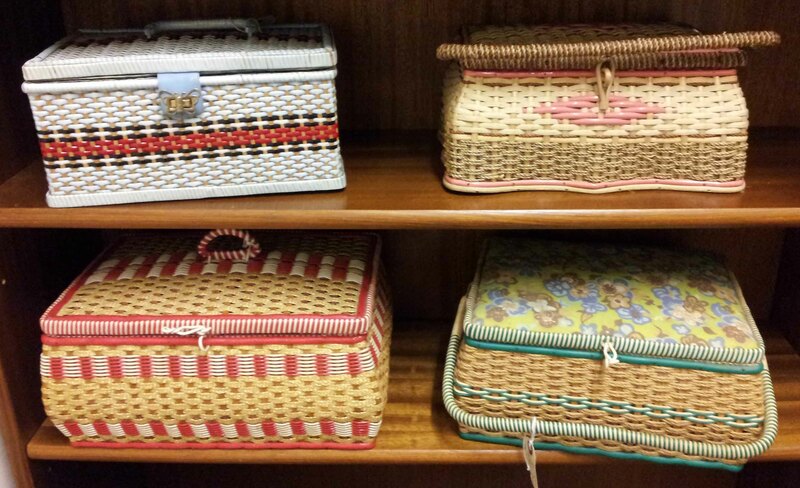 As you may have gathered, I like finding new places to visit in my search for vintage. 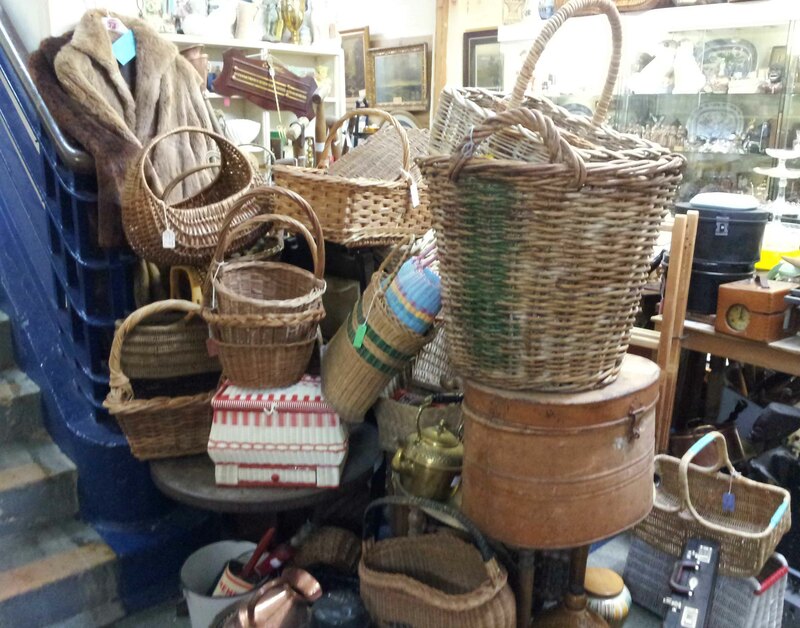 So I was happy to follow a tip from a work colleague about an antique centre north of Lincoln. Hemswell Antique Centre is housed on one of the many redundant air force bases left in Lincolnshire after the war. The military buildings have been repurposed into a series of antiques showrooms with a variety of sellers. 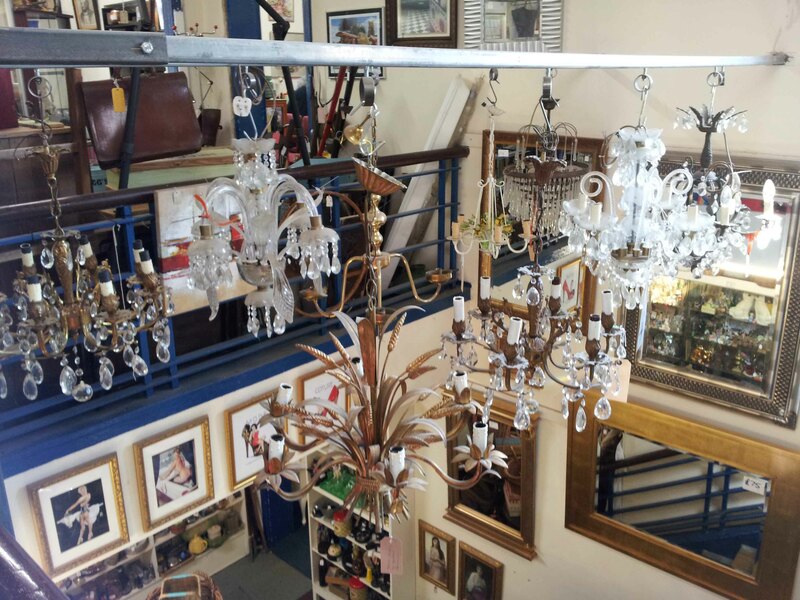 The stock varies from pure antique to vintage, with a side-order of more modern collectables. 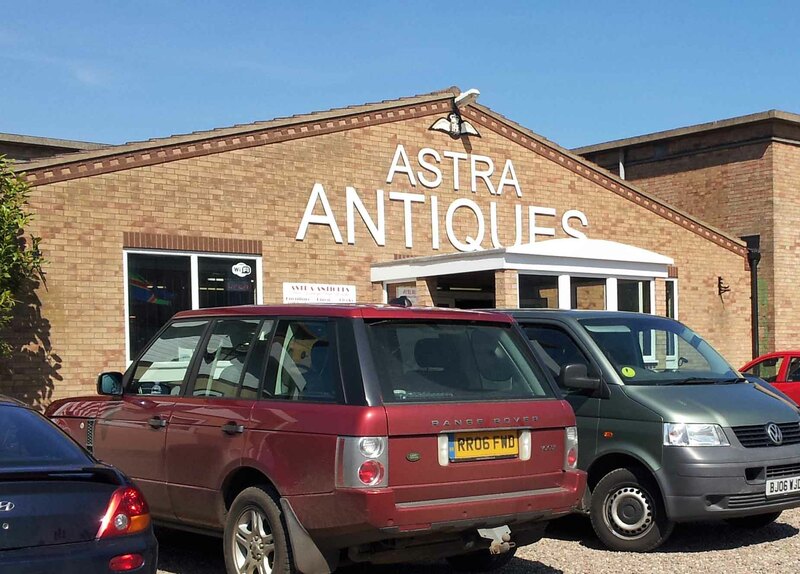 I spent most of my first visit in Astra Antiques, which took up most of the day. There was plenty of kitchenalia to keep me happy. 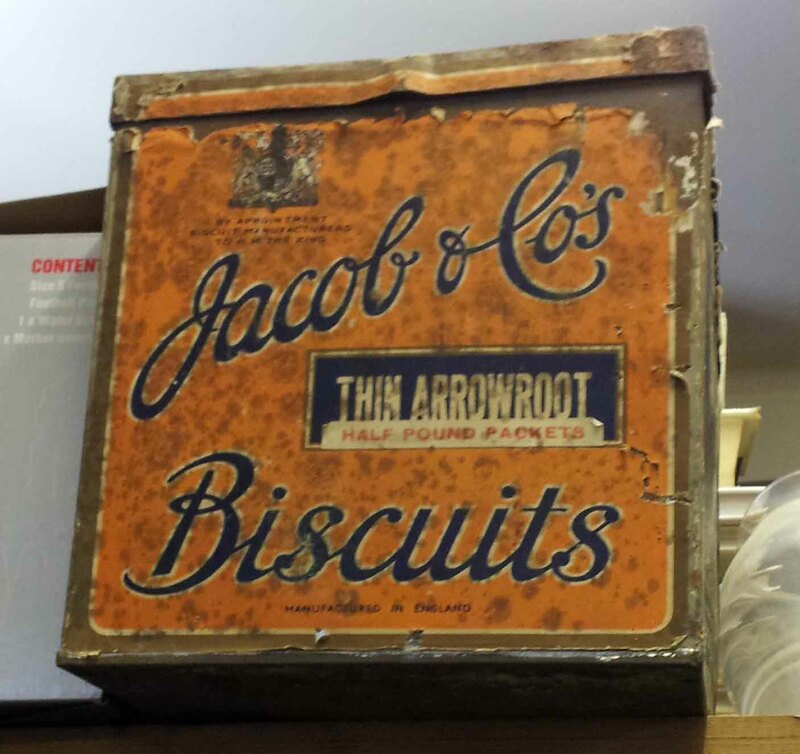 This biscuit tin was a bit too battered for me however. 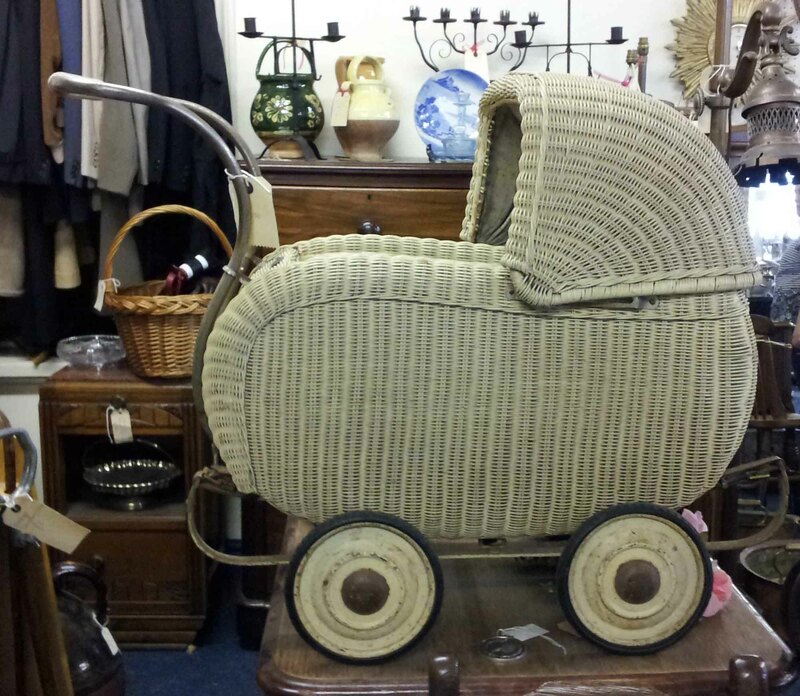 A toy pram made from woven material, a bit like a Lloyd Loom chair, but I couldn’t find any label to confirm my suspicion that they made it. How would you choose which one to take home? 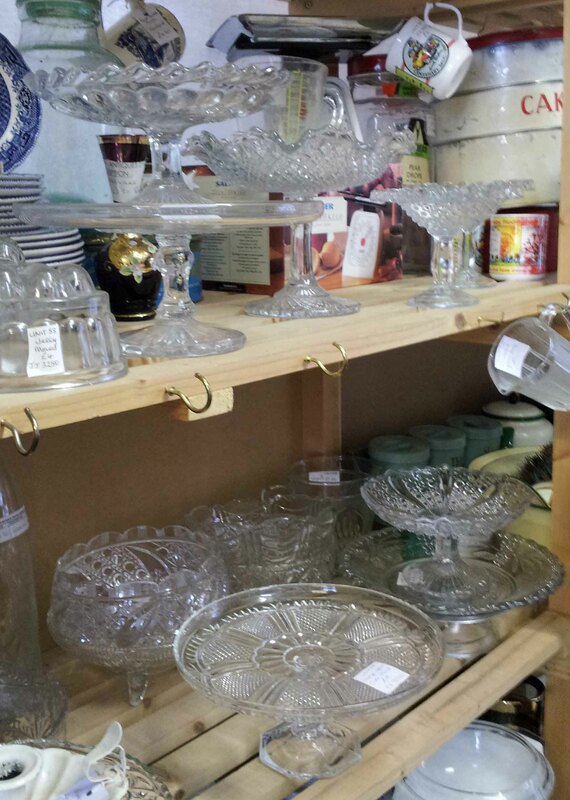 A lovely collection of glass cake stands. 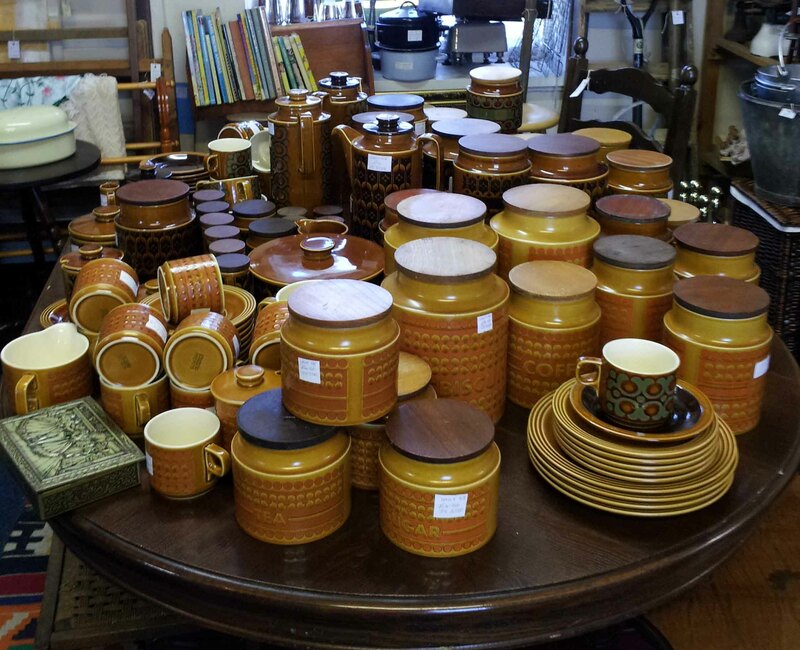 ,I’m used to seeing one or two items of Hornsea pottery but this is one of the biggest groups I’ve seen for a long time. 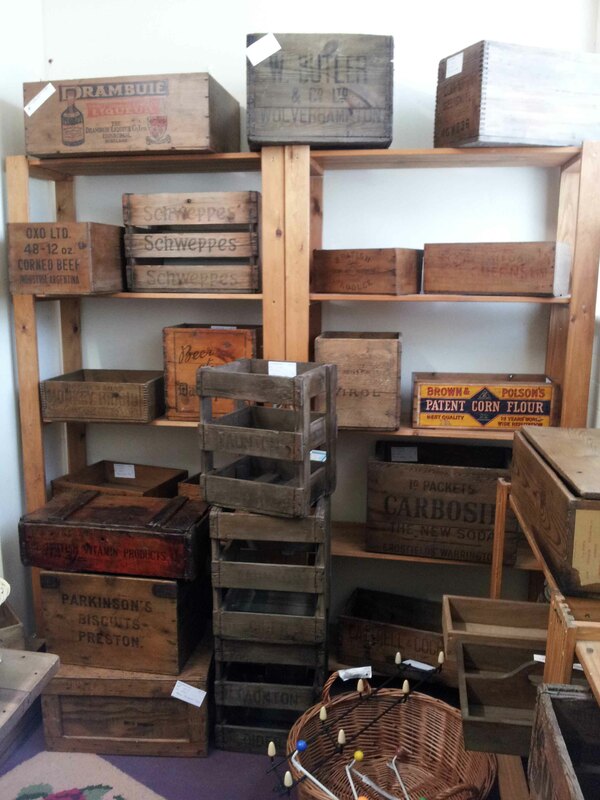 You might need a box to take your finds home with you – how about one of these? 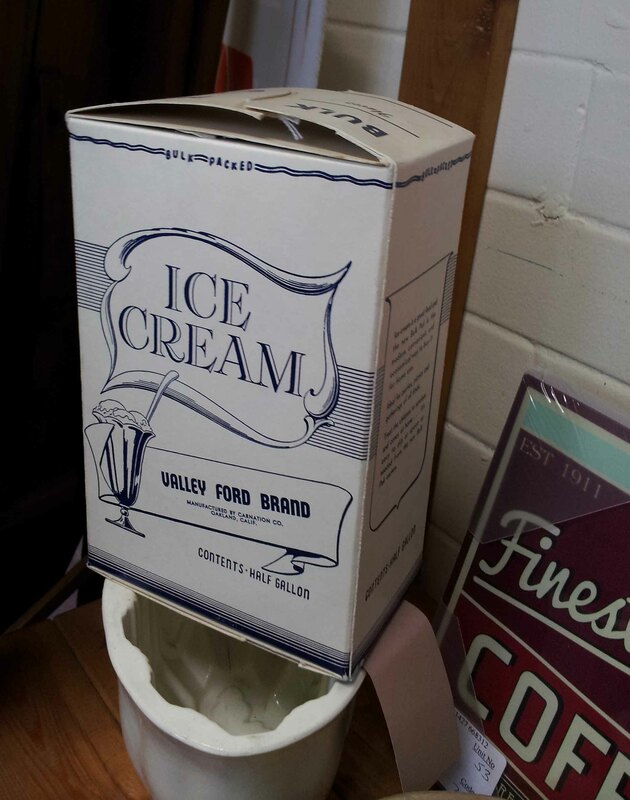 I’ve not seen an ice cream box before. I really liked the display of lights over the stairwell. I have one like the one in the centre at home, and I love it! 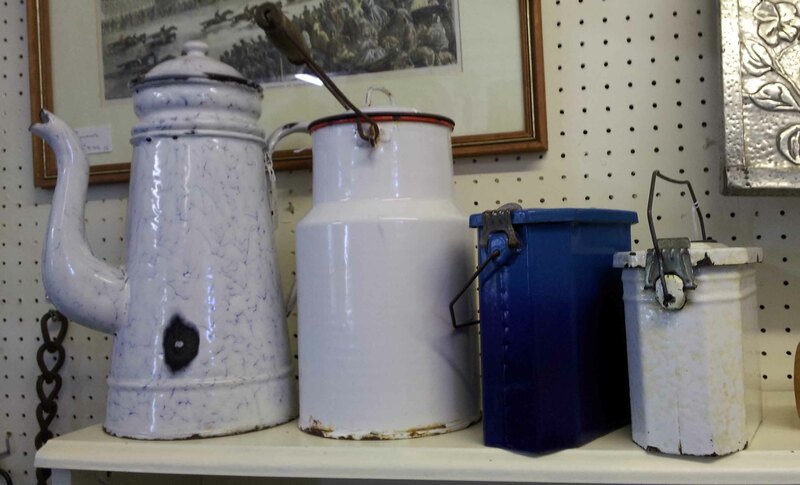 These enamel containers, for coffee, milk and lunch look to have come from France. 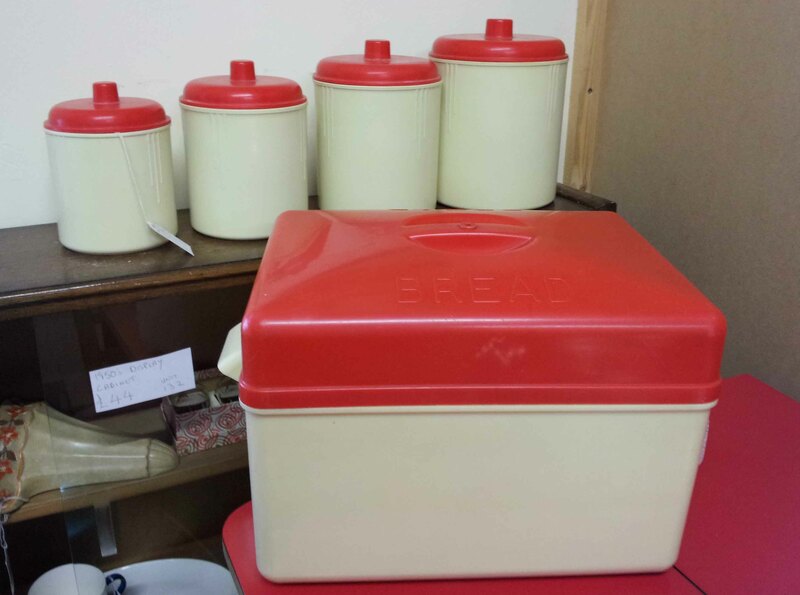 And finally, a full matching set of kitchen containers. This was only one building, and I was shopped out by the time I left. I’ll be back to explore the other buildings in the near future. In the meantime, I’d recommend having a look round yourself. As those based in the UK will know, it’s a long way to get from my base in Cornwall to anywhere else in England. As a result, I am more likely to travel around the South West than further afield. However, I’m quite prepared to go further for a good reason and this year I ventured North for a family Christmas. On the way, I took the opportunity to stop at Matlock in Derbyshire, which is a lovely little town that I have often passed through but never fully explored. Running parallel to the river, I found Dale Road, which is well worth a visit for visiting vintage fans. These elegant shop facades date from Matlock’s days as an important Edwardian Spa town. The Old Picture Palace on this street is home to Bamford’s Auctioneers http://www.bamfords-auctions.co.uk and may be familiar to viewers of Flog It! and Bargain Hunt which both film there on a regular basis. 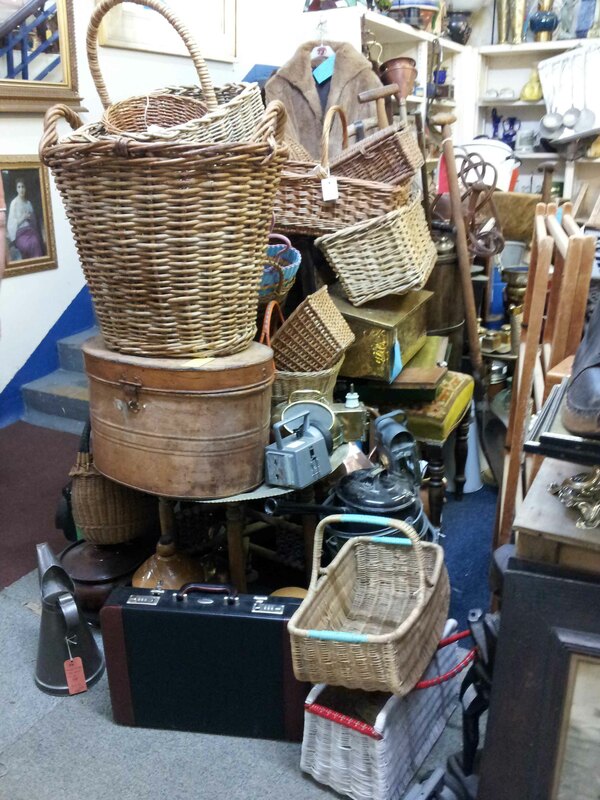 Next up the street, I found ‘The Vintage Rooms’ , a mix of French and British vintage mixed in with modern, vintage sympathetic items. My apologies for the reflections, my camera couldn’t cope with the dusky light. You can get a feeling for the glorious mix of items in the shop. This rather gruesome bit of equipment was used for drying wine bottles. I liked the idea of using it to display Christmas decorations. The floor tiles look like the original terracotta, and I remember my Grandma having an ironing board like the one next to the stove. Vintage kitchen cupboards. I love the cream and green combination, it reminds me of my Grandmother’s kitchen when I was a child. Check out the blocks of ‘Fairy’ soap, and the old packet of Persil! Also on a kitchen theme, this kitchen airer was used to display more vintage finds. Next door, I found , but sadly wasn’t able to get in to investigate this intreaguing little shop. Finally, I found my way to the Matlock Antiques and Collectables Centre. I loved the display in this window, Christmassy, classy and using all the height of the magnificent curved Edwardian window. I think this charming tambourine dates from the fifties. And on a Christmas note, how about this to cook your Christmas pudding? Still on a Christmas note, this unusual cover conceals a record telling the story of Christmas, with an accompanying book. I thought the artwork was fantastic. Check out the dough scrapers at bottom left, and the choppers halfway up the front of the table. You’d need serious smuscle to work in this kitchen! Sadly, time and lack of daylight caught up with me at this point, so I had to call it a day and carry on with my journey. But I will definately be back for a repeat visit. There’s a cafe overlooking the river at the back of the Antiques Centre to check out, and I still haven’t made it into the town centre! 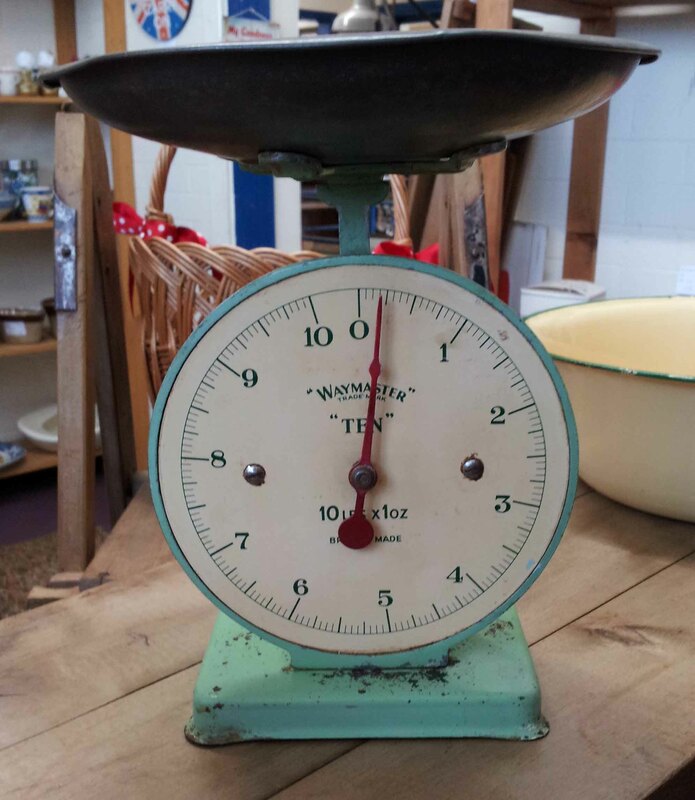 Auction Finds – Time for Tea? May I Introduce You To…?